The wonderful team at Emmy's Organics was so kind and sent me four packages of their organic coconut cookies to try out and review for you guys! I already knew about Emmy's before they contacted me and was absolutely thrilled when they did! I am in love with the little story of how Emmy's Organics got started and really wanted to share that with you because it just puts an instant smile on my face and hope it will brighten your Monday a little bit. "Emmy’s Organics, Inc. was started by couple, Ian & Samantha in 2009 in Ian’s mother’s home kitchen in Ithaca, NY. After struggling for many years with digestive problems, Ian had to change his lifestyle at a young age to avoid gluten, dairy and other irritants. His path led him to learn and work in a number of restaurants and cafés in New York City and San Francisco. After meeting Samantha, the couple realized that they both shared a similar passion for health and well-being. Samantha grew up as a dancer and a self-proclaimed “health nut.” One night, Ian taught Samantha a coconut cookie recipe that he had developed many years prior. 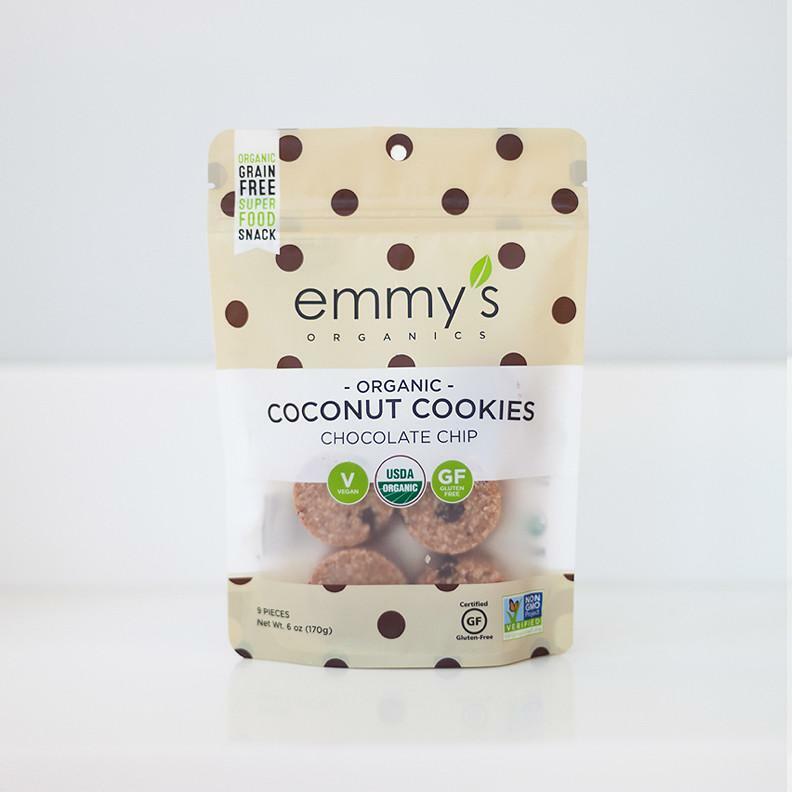 Seeing how clean the ingredients were and how easy the recipe was to make, a little idea was sparked that is now Emmy’s." 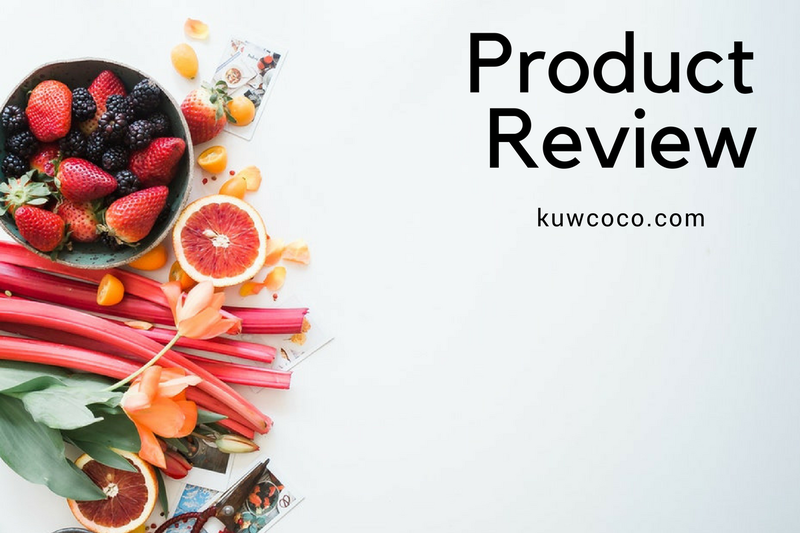 I really hope your smiling after reading that because I know I am, but let's get started and hop right into my review! When I got the package it was like they knew exactly who I was and what my favorite flavors were because I opened the box to see Chocolate Chip, Vanilla Bean, Peanut Butter and Dark Cacao flavors all lined up for me! I am gonna be honest, normally I like to take my own photos of products but the second I opened up the package I, without hesitation started opening the packages and started tasting them. I am very sorry but my tummy is not! 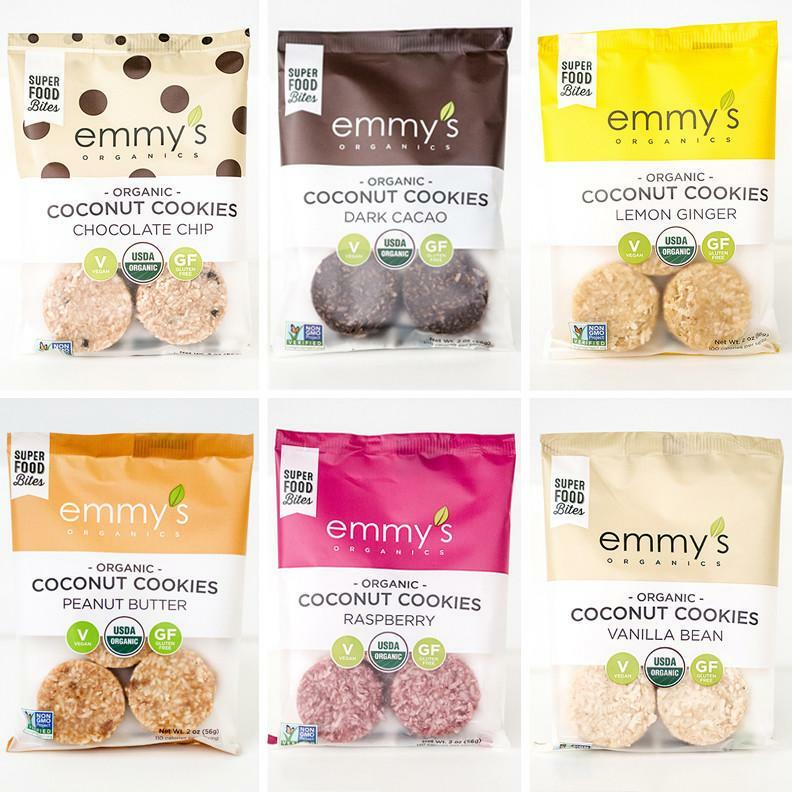 These Coconut Cookies are vegan, USDA certified organic, gluten-free and grain-free. I was gluten-free a few years ago and was very strict with my diet and these would have been the best snack for me. Let me start off by saying coconut is one of my favorite things in the whole world. I didn't know what to expect when I saw coconut cookies but I was pleasantly surprised when I tasted them. They really are almost all pure coconut made into little cookie shaped patties with added flavoring which could not be more up my alley. I am a peanut butter lover and hands down the peanut butter was my favorite but all other flavors followed very closely in second. I also wanted to mention that these have 100% become my go-to dessert. I just started Weight Watchers and the chocolate chip, vanilla bean, and peanut butter coconut cookies are all five points for one cookie. (The chocolate chip is only six.) Some of you may think that is a lot for one cookie but one cookie is extremely filling, satisfying and I usually end the day with a few extra points anyways and this is the perfect way to end my day. Whether you are vegan, eat organic, gluten-free or grain-free or just like to eat food, in general, you have to try these coconut cookies out. Coconut lovers, you can thank me later. Also, I am dying to try the raspberry ones, if you have let me know what you think of them!